Bankers are forever seeking out better security for themselves and their customers and the digital world is no different. That is one reason why a few years ago some savvy players got together to launch the "dot-bank" website address just for banks. For its part, the Internet Corp. for Assigned Names and Numbers (ICANN) officially approved dot-bank and bankers are all over it. Consider that industry group Financial Services Roundtable reports that as of the end of the first week, about 2,100 banks had applied for more than 5,000 dot-bank sites. Meanwhile, SNL reports more than 2,400 banks have submitted about 5,700 applications for dot-bank domains since May, when they went on sale. To some this may seem crazy and expensive. After all, the nearly universal "dot-com" has pointed the way to commercial sites for 20Ys and it seems to work just fine. Well, that is partially true, but it is also true that dot-com rules are a bit loose by banking standards. For an example, just type in www.firstnationalbank.com and you'll find that domain redirects you to online lender personalloans.com. We would venture to say the 322 FDIC-insured financial institutions that have "first national bank" in their name find this quite disturbing indeed. No such problems should arise with dot-bank. The American Bankers Association and the Financial Services Roundtable formed a group called fTLD Registry Services to parcel out dot-bank and dot-insurance only to qualified users. To obtain a dot-bank domain, a company must be a bank or savings association chartered and supervised by a government regulatory authority. Trade groups are eligible, too. Service providers and regulators have to get special permission from fTLD. The dot-bank vetting process "will be thorough and secure," the ABA says, including "charter verification through the applicant's local and/or national regulators." In addition to the registration restrictions, the dot-bank domain also has a higher level of encryption and should make it harder for criminals to create "spoofed" emails or redirect consumers to fake bank websites. If you are not too sure about this still, and have not yet shopped in the fTLD store, time is ticking by for the choicest domains. 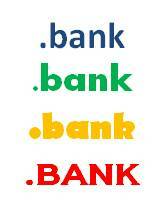 In addition, while you may have the dot-com associated with your bank's name, that does not mean you are automatically entitled to the same dot-bank domain. The only way to be sure is to register your trademarks with ICANN, as domain names are being awarded on a first-come, first-served basis to trademark holders. This is also an area where a little creativity in bank-naming could pay off. "Common Community Names," which fTLD defines as "words or phrases commonly used by significant number of companies/organizations within the banking community," are off-limits. Hence, there will be no firstnational.bank or firststate.bank, to name two examples. Generic product names are also banned, so your marketing teams should be involved. Finally, you can have your dot-com and dot-bank too. Consider that SC-based South Atlantic Bank is reportedly an early adopter, with southatlantic.bank already up and running alongside southatlanticbank.com. We will all have to wait and see the potential impact of all of this, but it is an interesting opportunity for banks. If dot-bank all works as billed, customers will know they are dealing with a legitimate bank, domain names will correspond to trademarks and security should be enhanced. Even better, it may also show customers that banks can innovate and are thinking of them when thinking of security and other enhancements. Yields declined 4bps due to global growth concerns fueled by China's import figures. Yadkin Bank ($4.3B, NC) will acquire NewBridge Bank ($2.8B, NC) for about $456mm in stock. The CFPB is warning bankers to avoid entering into marketing services agreements where payments are made to third parties (real estate firms, builders, mortgage insurers, etc.) for so-called advertising, in return for loan referrals. The CFPB said it is deeply concerned about the practice and that such payments are not allowed under federal law (RESPA). The CFPB also said, "Any agreement that entails exchanging a thing of value for referrals of settlement service business likely violates federal law, regardless of whether a marketing services agreement is part of the transaction." The Basel Committee on Banking Supervision will reportedly propose a revision to standardized approach credit risk measurement that will allow banks to use external credit ratings. Dow Jones reported it was hacked on Friday and client data was exposed. The unit includes the Wall Street Journal and MarketWatch. Research by Deloitte of executives, managers, analysts and crisis professionals from companies worldwide finds respondents felt their organization was the least prepared for: terror attacks (36%), don't know or not applicable (23%), cyber breach (18%), natural disasters (10%), malevolence or financial crime (7%) and industrial or technology accident (6%). In a move that could ripple across the country, CA has enacted a law that prevents law enforcement agencies from looking at your data or GPS location information without a warrant. The law revolves around digital privacy and blocks law enforcement agencies from forcing businesses to turn over emails, texts, or documents without a warrant. Research by Celent finds 92% of institutions polled said the use of tablets for front line staff is highly or extremely likely to be used in bank branches. JPMorgan will reportedly tell employees they have to begin paying for their smartphones in a move to cut expenses at the company. Other banks will be watching this closely, so look for others to soon follow suit.